Heres a superb new online slot adventure form Yggdrasil gaming. Ever wanted to take a peak into your third eye? Ever thought about knowing what kind of visions and creatures that your imagination would create? Before you ask the question, no. You don't have to go into a deep meditation session and wake up your Kundalini. Go ahead and play slots online at this link! However, you can sit back on your sofa and turn on the online slot game, Nirvana, on your devices to get almost the same kind of experience! Filled with animals that you'd never thought you could create inside your head, Nirvana can make you switch off from the outside world, and delve deep into your aura. All know that you will receive, peace, tranquillity, and a big wad of winnings in your pocket. You play from a range of Yggdrasil Gaming slots games as well as find out more info on slots games at Wizard Slots online casino. Yggdrasil, the name of the Scandinavian mythology which would be translated into 'Huge Ash Tree' is the name that the former NetEnt CEO has decided to take ownership for this fairly new iGaming brand. Since their establishment, they have been renowned and appraised for the amount of talent and technology that they have to put into each and every one of their games. And with that technology, they make sure that every single one of their online products can be easily accessed via laptop, tablet, and smartphone. If you don't think that Nirvana will live up to your expectations for the developers, then take a look at some of the reviews for their previous games like Winterberries, Vikings Go Berserk, and Bicicleta before you tap on the play button! Alongside the traditional 5 reels that you will see on the Nirvana slot game, your screen will be covered in colours, jewels, and animals that look like they'd fit on a printed shirt you'd get from Woodstock. If that doesn't make you feel like you're back at the festival, then the soothing, euphoric music playing in the background will. Read details below to discover more. The base symbols that will see on the reels come in the form of blue diamonds, purple clubs, green diamonds, and red hearts that you need to get in a matching combination to gain some winnings. But if you want to reach a higher plane, and higher winnings, keep a sharp eye on the cat/eagle hybrid, the horned rabbit, snake, and the golden Phoenix that give you bigger payouts. If you see these creatures slither and fly onto your screen, don't worry, you're not hallucinating! Don't stop there, though. The Nirvana world is not as linear as it may seem, for there are a lot of special symbols and BONUS FEATURES that the creatures bring to your game board. 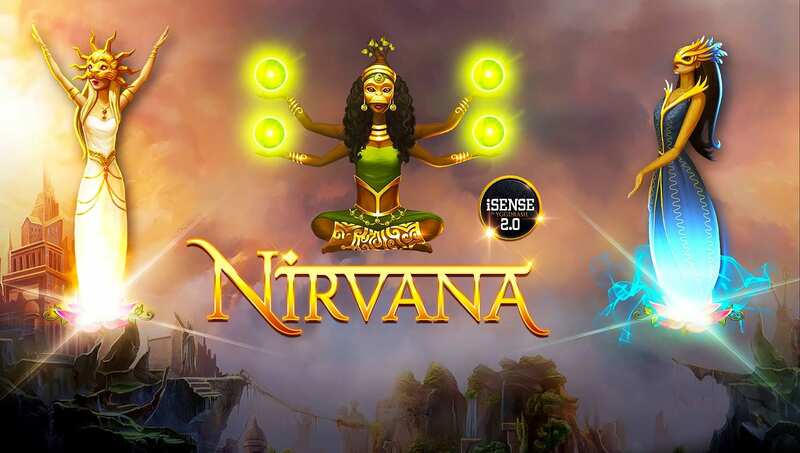 Nirvana WILD: This symbol can substitute all of the base symbols on the reels to make a winning combination, except for the Free Spins SCATTER symbols. 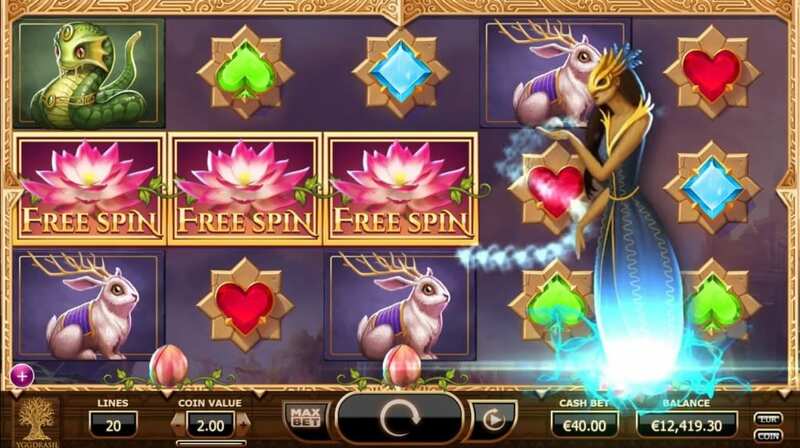 Free Spins SCATTER: Getting either 2, 3, 4, or 5 of these symbols on your reels win you either a free spin, 10 free spins, 10 free spins, 10 free spins and a 1,000 coin payout, or 10 free spins and a 5,000 payout. Getting 3 or more of these symbols on your reels will also trigger a bonus round. Bonus Round: activated by the Free Spins SCATTERS, you'll be given the choice of 3 BONUS FEATURES to select that can help you win some big prizes in this special round. If you activate a single free spin by spinning 2 of the Free spin symbols, the special feature will be randomly chosen for you. WILD Seeds Feature: This will create 2, 3, or 4, WILDS on any position on the reels. They act the same as the normal WILD symbols do. Mega Reels Feature: This will get you identical symbols that all match on the 2nd, 3rd, and 4th reel that will optimise your chances of getting a high pay out. • Nudge Reels Feature: This will enable one of your reels to be nudged up or down, which can make a difference between a big and a small winning.